For an outdoor adventure the whole family will enjoy, plan a day trip to Bryce Canyon National Park. The views are breathtaking from dawn to dusk, especially at Bryce Canyon Sunset Point. As the sun dips below the horizon, beautiful light is cast over the hoodoos. The way the shadows nestle into each crevice of the carved rock formations will have you in awe of this area’s natural beauty. Visiting this national park is sure to be a highlight of your trip to Southern Utah. If you plan on visiting Bryce Canyon Sunset Point in the near future, we recommend downloading our Southern Utah Vacation Guide. Our complimentary guide will cut your planning time in half. 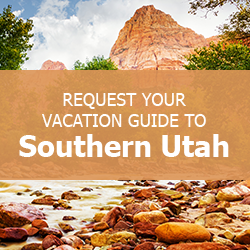 You’ll have access to information on all of the best outdoor recreational activities Southern Utah has to offer, plus learn about restaurants and upcoming events! Bryce Canyon National Park is home to quite a few trails of varying difficulty. With the family in tow, you will definitely want to check out the Sunset Point to Sunrise Point Trail, which is part of the Rim Trail. The walk between the two points is paved and the views are worth the walk. Just one mile from the Visitors Center, the Bryce Canyon Sunset Point can get pretty busy, so be prepared for a small crowd during prime viewing times. From the trail, you will be able to see the rock formations known as Thor’s Hammer and Silent City. Before your hike, be sure to stop by the Visitors Center. Get all of your questions answered at the help desk, watch a 22-minute film on the hour and half hour, or shop for a souvenir at the book store. There are even exhibits and a prairie dog maze. Bryce Canyon National Park is open 24 hours each day throughout the year, though the Visitors Center’s hours change seasonally. From May to September, it is open from 8:00 a.m. to 8:00 p.m. From the months of October through April, the hours are 8:00 a.m. to 6:00 p.m. From November to March, the center is accessible from 8:00 a.m. to 4:30 p.m. There is a $30.00 vehicle charge upon entering the park. If you enter by bike or on foot, it is $15.00 per person or $25.00 per motorcycle. Once you’ve paid the entrance fee, you are able to come and go as you please for up to seven days. Throughout the year, the park occasionally offers special days when entrance is free, including September 22, 2018, known as National Public Lands Day, and November 11, 2018, which is Veterans Day. Check the website to learn more about free parks days and events. The perfect place for your family to spread out and relax is in one of our Family Time Vacation Rentals. Our properties include luxury cabins, condos, and large vacation homes. When booking your reservation, ask us about a stay in our Gateway to the National Parks cabin. Just a 25-minute drive to the park, this three-bedroom cabin offers stunning views from the large wraparound deck. Inside, you’ll find modern amenities including a full kitchen, a washer and dryer, two gas-burning fireplaces, and a large grill outside. Let us be your home away from home on your getaway to Utah. Browse our complete catalog of available properties and start planning your getaway. We look forward to hosting you and your family soon!